Fields of Blood: First spacewolf list, curious on your thoughts? so the first space wolf list I knocked up is what I've started (and nearly finished) painting. I'm curious on peoples input, because while it has done well in its initial games, they havent really been tested yet, and I have a million different changes and additions swimming around in my head. The wolfguard split and go with the wolfscouts + 4 grey hunters squad. The runepriest goes with one of the squads in their rhino, and the wolf lord treats the fenrisian wolves as ablative wounds from shooting while trucking through cover. Some of my thoughts for chopping and changing; swapping Jaws of the World Wolf for Living Lightning. Changing the rhinos to razorbacks, removing the wolf lord and fenrisian cavalry for more razorbacks. Switching the runepriest for Njal Nomates, running without the wolf lord, and in 1750 points probably without the wolf scouts as well while I rock along more razorbacks (probably ~6 or 7). 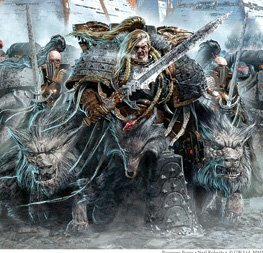 While the wolf lord has been fantastic in most games, sometimes 3 wounds just isnt enough, and I wonder whether I really need to have a counter to the threats he's there to counter? Yes, with the dogs absorbing wounds he wrecks a unit of meganobs on his own, but is he ever actually going to need to do this? Food for thought, and would love to hear others opinions. Should add, did the points from memory, dont have army builder or codex with me, so forgive me if I'm off a little! Charlie, don't change a thing, not sure I would even want to play around with it as I immediately like what I see! I think the extra assault reach and potential of the Wolf Lord is invaluable, and needs to stay, even if you think 3 wounds is not enough! Looks very competitive....whuich is a good thing. And to me it looks like an army. Suspect it will behave very very consistently. To me the big things are Split Fire on LFs and Counterattack on the Grey Hunters. Awfully solid base. The rest is all cream. One of the guys at my local club used to run a tooled up Lord (well Lords in his case actually) + Wolves but stopped because he found that once you hit combat the Wolves become a liability (free combat res basically) and while the Lord is a real mission to kill and hits hard until he dies there is only so much he can do by himself. He has to be constantly threatening stuff and generally hitting expensive units the whole time to get his points back. Obviously you can work around this, but just thought I would throw that into the mix. Personally I would go for a mix of Razorbacks and Rhinos rather than going completely one way or the other. Razors to sit back and help the Long Fangs with fire support (Long Fangs are an easy place to get more Razorbacks if you scale this up to 1850, they can really use the transport in DoW) and help hold backfield objectives while Rhinos push forward into the midfield and take pot shots out the top hatch. Similarly you can also do a mix of squad sizes to go with this, smaller squads (maybe with flamers since not many vehicles should be getting past all the melta you push forward + the Long Fangs) in the Razors and larger more combat orientated, double melta squads in the Rhinos.